Family Dogs and growing babies....life, lessons and love! 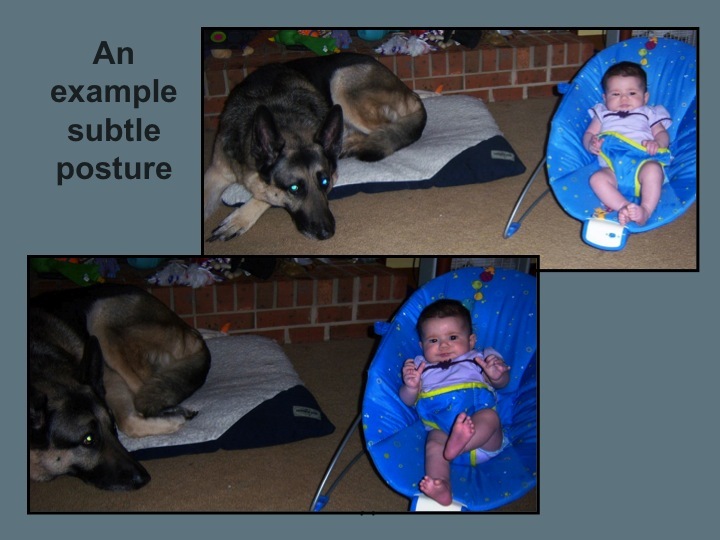 : A baby, a dog and a "moment." A baby, a dog and a "moment." As a Mother of four kids I know first hand how easy it is to step out for of a room for "just a moment" to do something. There are many times during the day where these "moments" present themselves. Bathroom trips, heating food, answering the door etc. When there are dogs in the home families must take seriously the fact that a "moment" is never ok to leave to a dog and baby! Why? Because in a moment a baby can go from boring to interesting to a dog. If you are not there then you are not aware of any change and things could go very wrong. Let's look at the photo below. (photo from the program Dogs & Storks by Family Paws) In the first image the dog is looking at the camera and is resting. The baby also is resting and relaxed. Then the next image the focus of the dog is different....why? What changed? All newborns are UNFAMILIAR to any dog in a home. The newborn time is a getting to know you time for parents, baby and the family dog. Dogs learn about the baby through observation over time with full awake adult supervision and direction. There are many ways to safely include family dogs during this transition. New parents can control the safety in their home by planning ahead. Our program Dogs & Storks offers tips and information about ways to prepare before and after baby arrives. Planning for these "moments" sets you, your baby and family dog up for success. **** Suggestion: If you are a new parent or expecting a baby in the near future. Please sit down and brainstorm all the "moments" you can think of that might cause you to leave the room. Then discuss with your spouse or partner how you will handle the dog/s and where the baby will be in those precious moments. You have full control over the safety of your newborn and with planning and preparation you will be successful. At what age does this change? Once the dog is used to the child and he/she is a bit older, then is this sort of moment safer? All children should be supervised but an infant....especially a newborn MUST always be supervised with a dog as the baby is unfamiliar to the dog. My rule of thumb is that dogs and children must not be left unsupervised until the child is able to predict and outcome and empathize. This is not so much an age as it is a behavioral milestone. The reason for this is that dogs and children misinterpret one another quite easily and that can be dangerous. Dogs are dogs and they will are predictably going to act like dogs. This means playing in ways that may not be safe and could be misinterpreted or dangerous.